It’s 9 in the morning, but Wade Tenney is sitting in the dark. Crouched on the floor, ultrasound probe in hand, he slowly examines the lower leg of his patient, a 19-year-old Swedish Warmblood. The dressage horse has a partially torn tendon. “It’s amazing how athletic they are, yet how helpless when it comes to injury,” says Tenney of his equine patients. A clinical assistant professor of large animal ultrasonography at the Cummings School, he estimates that horses make up 90 percent of his caseload. Tenney joined Kate Chope, another ultrasonographer working with Tufts’ Equine Sports Medicine service this year, doubling the capacity of the Hospital for Large Animals to assess injuries using this diagnostic tool. Veterinarians rely on ultrasound—which uses sound waves to make pictures of soft tissue—to diagnose a range of problems, from ligaments and tendons to intestines, the liver and lungs. His new job represents a homecoming of sorts: Tenney received his veterinary degree from Colorado State University but grew up on a farm in southern New Hampshire, about an hour north of the Cummings School. “We had as many as eight horses at a time. I have four sisters; we all rode and were involved in 4-H,” he says. As a freshman at Cornell, Tenney played on the polo team. It was then he began to recognize that horses were also athletes and developed an interest in caring for them. “They get injuries running around, working out, making quick turns, just like any human athlete,” he says. 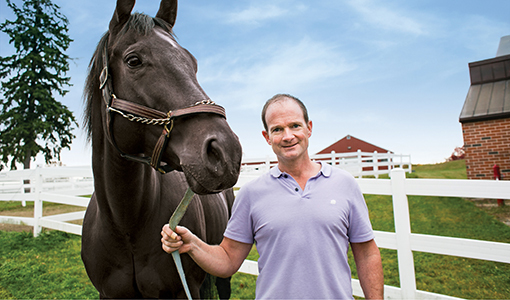 After graduating from vet school in 1997, Tenney worked as an equine and large animal veterinarian at a number of practices. At one busy referral hospital in New Jersey, he cared for horses that competed on the U.S. Olympic Equestrian Team. “I knew a little bit about ultrasound, but I wasn’t using it to its potential,” he says. He believed the noninvasive diagnostic technique could assist him in making more informed treatment recommendations to horse owners than simply palpating the site of an injury. So after nearly 10 years as an equine vet, he decided to pursue training in ultrasonography, completing an internship in large animal ultrasound at the University of California, Davis. Ultrasound is used widely in small animal medicine for detecting things like intestinal blockages and tumors or assessing heart function. But very few academic veterinary medical centers have a large animal ultrasound service. At Tufts, Tenney saw an opportunity. “You can ultrasound just about anything on a horse, besides the hoof,” he says. While X-rays are good for finding broken bones, they won’t show inflamed tendons or torn ligaments. In human athletes, magnetic resonance imaging (MRI) is often used to diagnose such injuries, but because horses require general anesthesia to lie still in an MRI machine, “ultrasound is much more practical,” says Tenney. On this particular day, after about 30 minutes of probing the Swedish Warmblood’s lower leg and peering at images of tendons and ligaments on his computer screen, Tenney points to a dark area. “That’s the injury,” he confirms. He rises from the floor, turns on the lights and gently rubs the horse’s head. An orthopedist comes in for a consult. They decide the animal needs six more weeks of rest and light exercise before resuming dressage. Tenney gives ultrasounds to two more horses before the end of the day—a Hanoverian with a slight limp and a towering Shire with arthritic ankles. The owner of the Shire, an equally hulking man with enormous boots, hunkers down to peer over Tenney’s shoulder. The veterinarian points out areas of inflammation on the screen and then asks the owner for his thoughts about a treatment plan. “We want to get them back to work as soon as possible without risk of reinjury,” says Tenney. He clearly enjoys the variety of cases he sees—“wounds, liver failure, lameness—a whole spectrum of stuff that helps keep me abreast of the latest trends in treatment.” And it’s not just equine sports medicine; he’s done ultrasounds on alpacas, donkeys and even a pig. Lindsey Konkel is a freelance writer in Worcester, Mass.